Myzdamena's World: What's On Yours? Oooh, ooh we could do a joint WOYWW... even though it will be a saturday... nah your table probably couldn't take two of us. Well, I showed my dining table full of books last week, this is much more usable at least! Lovely pile of stash there, thanks for sharing. Oh carpy lollocks! You know what I've done? The parcel is in the post - the CD is indeed on my shelf still... but it was meant to be in the parcel cos I actually got my bum in gear and finished it! Aaaaargh! Was going to be a nice surprise for you. That's two things I've forgotten now! your christmas cards are gorgeous! must get started on my mine, its shameful that I always leave it until the week before christmas! eating dinners off laps isn't so bad, a girl has to have somewhere to craft! Nice Christmas cards going on there and there's nothing wrong with eating your dinner off your lap as long as you put it on a plate first!! Had to laugh at the eating comment. I guess you will have to eat off your lap, because I don't see a whole lot of room on that table (big grin). That just means you are busy, though. Happy WOYWW. 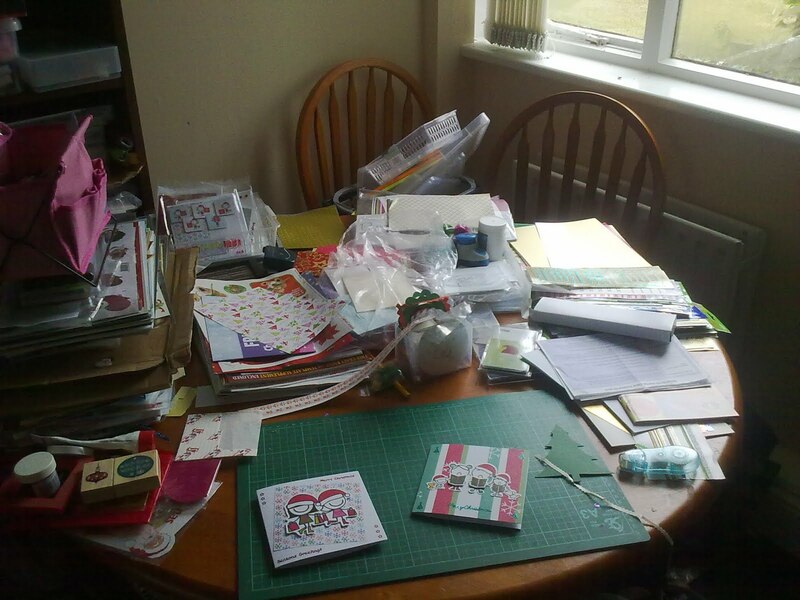 Ahh the dining table syndrome in action !! LOL, i don't think i could get my hubby to eat off his lap! such a small workdesk, fab workspace, Happy WOYWW, Thank you for showing us your workspace. Well I think the least you could do is give your poor family plates to eat their dinner off! On the plus side, the workspace looks pretty neat with those two cards taking up most of it, lol! my dining table often looks like that too! 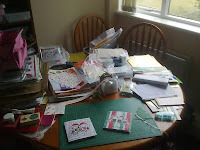 I think that my husband would leave home if he had to look at my mess all the time... good job I have a space out of sight. Your table looks fairly organised though! Dinner in front of the tv is much better anyway!! 3 stone Myz - how fab you are, what staying power. That's me - get out all the stash, fiddle about and then walk away for a week. Good luck with the school walk...take it easy. Joking aside, thanks for sharing your space with us - and get on with those Christmas Cards!